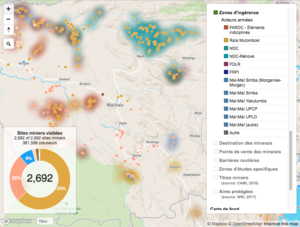 In a new report and webmap, IPIS presents its updated data on armed conflict and armed interference in eastern DRC’s artisanal mining sector. 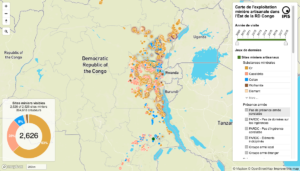 Building on extensive data, gathered over the last ten years, IPIS assesses the impact of responsible sourcing initiatives in DRC, designed to address armed interference in mineral supply chains. 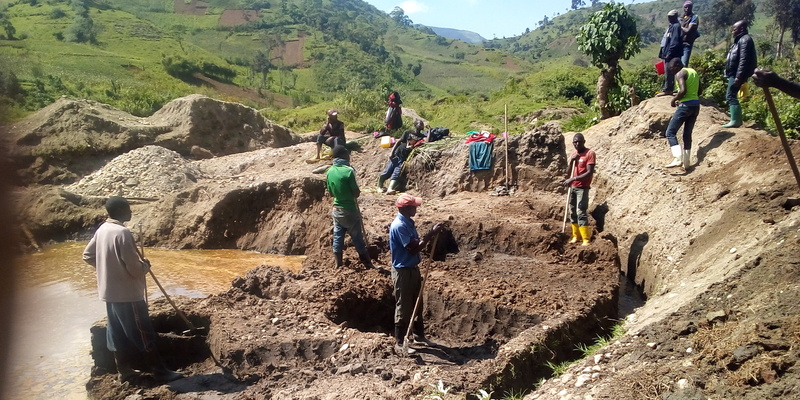 The report illustrates that responsible sourcing efforts have indeed improved the personal security of groups of artisanal miners in several provinces. However, these are relatively fragile gains and the underlying problems remain unchanged. IPIS also establishes that most of the armed conflicts appear to be unrelated to mining activities. Armed interference in artisanal mining often rather concerns illegal ‘protection rackets’, while armed confrontations largely take place elsewhere and for other stakes. Nevertheless, these protection rackets do contribute to the overall insecurity in eastern DRC and further stigmatizes the region to be an impossible area to conduct ethically responsible business. IPIS’ data on roadblocks illustrates that artisanal mining is only one of the many sources of financing for conflict actors in eastern DRC. Furthermore, the research on roadblocks demonstrates that armed actors do not need to have direct control over mining sites to benefit from the artisanal mining sector. IPIS notes a consistent pattern whereby the army consistently erects roadblocks some distance away from the mines. Mines covered by responsible sourcing programmes experience considerably lower levels of armed interference. Yet this does not necessarily mean that responsible sourcing programmes is in itself the cause of increased security at mining sites. Often, it is precisely the (pre-existing) absence of armed interference that attracts validation and iTSCi involvement in the first place. Armed interference in mining seems to continue undisturbed in more remote areas. Nevertheless, IPIS data also shows that armed interference is decreasing over time in areas with more scrutiny – where responsible sourcing initiatives are being implemented. IPIS however also notes that the widespread corruption among state agents further enables illegal mineral supply chains to persist, and to contaminate ‘responsible supply chains’. It raises serious questions about the effectiveness of traceability. Responsible sourcing efforts and the wider reform of the ASM sector have had an important effect on mineral supply chains. Responsible sourcing initiatives have increased the level of organization of the artisanal mining sector (ASM). However, responsible sourcing seems to have been particularly instrumental to local elites. Miners claim it has not brought them any additional revenues. The limited impact of responsible sourcing on local development raises the question how sustainable the current situation is. So far, increasing regulation of the artisanal mining sector and responsible sourcing efforts, have rather had a negative overall effect on the socio-economic position of artisanal miners. The widespread establishment of cooperatives could potentially contribute to social and economic development. However, generally speaking, cooperatives have rather become vehicles that exploit miners, and can potentially further fuel already existing tensions. In order to increase sustainability, responsible sourcing efforts should increase their level of engagement towards national and local governments in eastern DRC. Externally controlled clean supply chains in a context of failing governance will not persist. It is a shared responsibility to ensure that in-country authorities manage to actually control responsible sourcing. 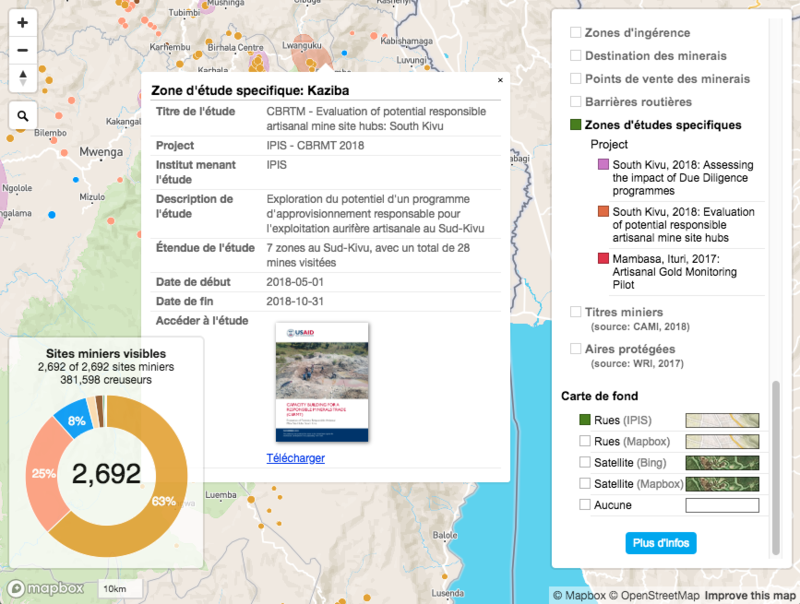 The new report is accompanied by a twofold update of the IPIS webmap on artisanal mining in Eastern DRC. 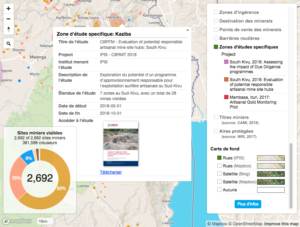 Firstly, the most recent mining site visits (up to January 2019) were added to map, as well as to the Open Data table on mining site visits freely available for download. Secondly, new features were added in order to make it easier to spot trends and improve the overall usability. The most important addition is a new map layer called ‘Zones d’ingérence’. When turned on, it displays a blur around mining sites where illegal interference was reported during its last visit. The blur is coloured depending on the armed group present. This results in the appearance of area’s of influence of the main armed groups. Furthermore, a map layer was added which localises special reports lead by IPIS. Next to its general mapping campaigns, IPIS sometimes performs studies with a special local focus. This layers shows the extent of these studies, displays information on their scope and provides a link to their reports. Finally, Bing satellite imagery is now available as background layer. This imagery is very detailed and allows to correlate data on mining sites with their actual spatial layout and surroundings.